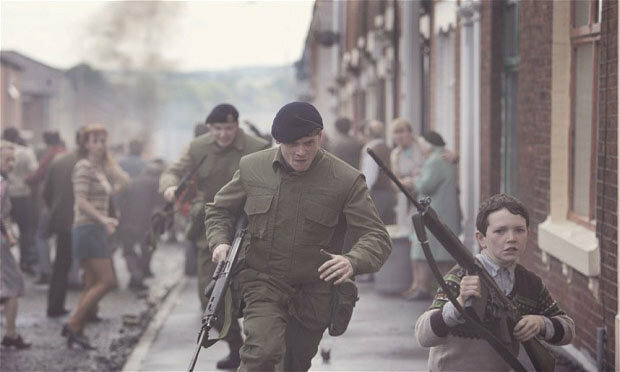 While this debut from director Yann Demange and writer Gregory Burke can be described as Behind Enemy Lines in Belfast, that oversimplifies things and would cut the guts out of what is a riveting, running thriller. And that’s all Demange and Burke are after here, side-stepping any political statement for a pure sight-for-survival actioner. It’s the titular year and Jack O’Connell (Starred Up) is a young soldier on his first tour of Northern Ireland. On his first venture into the city to guard an RUC raid, a local disturbance turns into a full scale riot. The confusion that follows sees the young private separated from his platoon, and O’Connell is forced to escape into the Belfast night pursued by an IRA splinter group looking to make a name for themselves. Hiding from an under pressure IRA that’s showing cracks with a duplicitous David Wilmot at odds with violent trio of McCann, Keoghan and Killian Scott, is tricky enough, but O’Connell must also duck and dive from Sean Harris’ British undercover operative whom he believes is setting him up as a pawn. And he’s unsure if Richard Dormer (Good Vibrations) and Charlie Murphy (Love/Hate) are just patching him up to shop him to the IRA, or if the helpful protestant kid (a brilliant Corey McKinley) is actually leading him into a trap. Demange and Burke are out to disorientate the audience as much as they can. With no map, no street signs, and because the top of one road might be friendly but the bottom hostile, they put the viewer into the shoes of O’Connell’s spooked and injured private. There’s no flab on the script; with no exposition, no back stories (bar brief bookends between O’Connell and a kid brother back home we know nothing about him), and no political pontificating to get tangled up in, Burke’s lean story-telling lets the plot skip along and Demange’s use of handheld camera adds to the tension. This is edge of your seat stuff for its ninety-nine minutes. The cast are flawless. But what catches the eye is the edgy O’Connell, the forever-underrated McCann, doing the dead-behind-the-eyes thing (he shares the best scene in the film with the lead) and Keoghan (Stalker), as the normal kid drawn into the provisional world.